Some of nylon’s stretch can be mitigated by how the fabric pieces are cut out. Curves etc. in seams and hems can help maintain shape. I far as I know, nylon is still the fabric of choice for shock absorption (parachutes, ropes) and does a good job for shelters suddenly loaded by wind or snow. It does sag a bit at times from temperature drops or moisture. 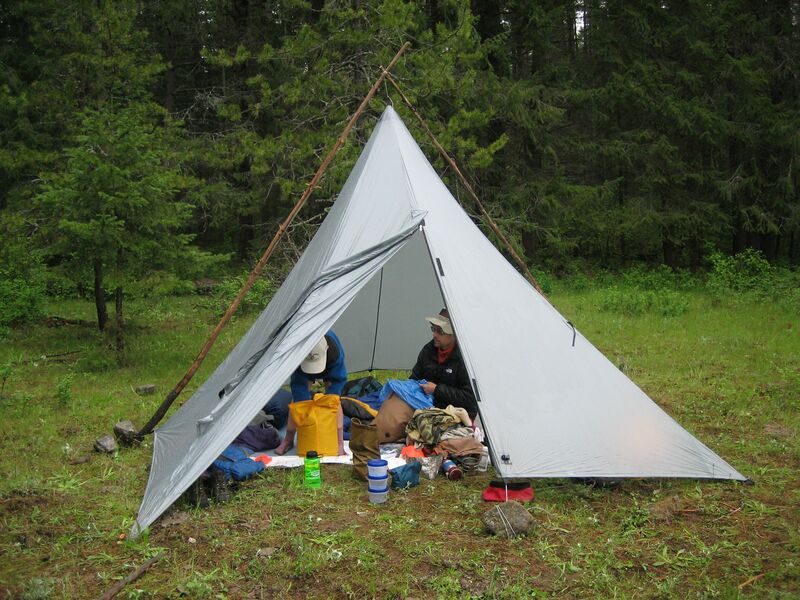 In something like a pyramid tarp, having a method for adjusting the pole upward to take up slack from within the shelter is nice. If your tarp pole is not adjustable, this could be as simple as having a stone handy to place underneath the pole. If you use outside shear poles, reaching under the hem and pulling the two pole bottoms inward can do the same. Be sure in any case or fabric type you stake out the hem in the right shape. On a symmetrical 4 sided mid, a diamond shape instead of a perfect square will produce saggy walls with any fabric. Floored shelters are easier to get the stake out pattern correct. On a floorless shelter you could tie tiny cords corner to corner to insure proper and repeatable layouts.